The men are shepherds, they say. The woodworker is bemused at the thought of shepherds spreading the news of the Savior coming. After all, wouldn’t God send the Messiah in an extravagant, more kingly way? Word filters through the streets regarding these rambling shepherds and their talk of the Messiah. The locals scoff at the idea. After all, this is just a town in Nazareth, not exactly a seat of power. The women move on, leaving the woodworker to his job. As he works, more people walk by his shop, some dressed in clothes like him, of Bethlehem some 2,000 years ago on a night that would change history. Others are dressed in modern apparel. They stand out, but they’re the reason for this event hosted by First Baptist Church of Burnet. Welcome to Main Street Bethlehem. 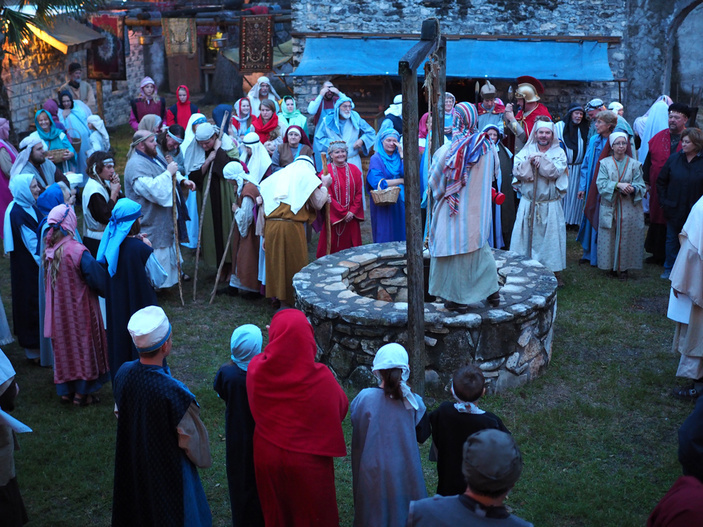 The live nativity scene goes well beyond a few sheep and a handful of actors playing Mary, Joseph, the shepherds, an angel or two, and maybe some wisemen. Main Street Bethlehem features full-size buildings complete with streets, shops, homes, and an inn. The annual event opens Dec. 7 about one block east of First Baptist Church, which is located at 108 S. Vandeveer St. It’s open 6-9 p.m. Friday-Sunday, Dec. 7-9 and 14-16. Admission is free, but donations are appreciated. As you begin your walk through Main Street Bethlehem, the merchants greet you as well as the townspeople. You’ll find soldiers keeping people in line as they wait to pay the tax collector, and, of course, there’s some gnashing of the teeth as the government official tries to squeeze every coin out of the person before him. Main Street Bethlehem puts you in the streets the very night of Jesus’s birth. But don’t race through to get to the stable and manger. Slow down and take in the scene. Let that night, so long ago, come to life around you. Experience what it must have felt like as the shepherds asked, even pleaded, for directions to the child who had been born in a manger, the child who would become the Savior. Reflect on Main Street Bethlehem and the idea of Jesus coming to the world as a baby, not a king surrounded by an army. Why would God want his son to grow up as a human and face all the temptations a human would? The church’s Pastor Doug Lindley said God wanted the humblest way possible to enter the world. That level of humility is often lost on us. Yet, God routinely turns to the most humble to serve. While Main Street Bethlehem is a re-creation of that night more than two millennia ago, the story of Jesus’s birth continues to grab us, pull us in, and change us. Go to fbcburnet.org for more information.